Today, Facebook and Microsoft deepened their existing relationship around search. At an event in Silicon Valley, both companies announced a new phase in their partnership, especially as it relates to social search. Bing will be adding more Facebook social data into its main search results. Starting today, if you do a search on Bing, it will try to recognize your Facebook account through instant personalization, and you will automatically start to see links that your friends have “liked.” These will appear in a separate module, with related social links called out. 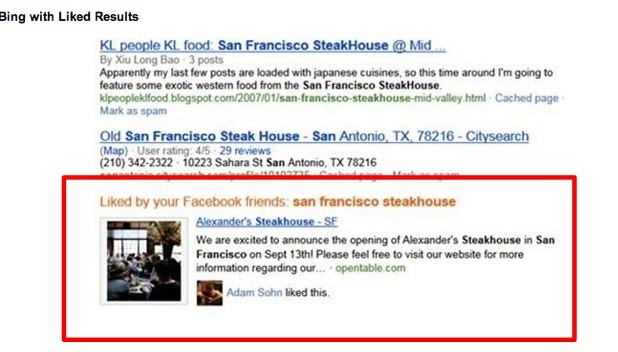 The example Microsoft gives is if you are searching for San Francisco steak houses and one of your friends liked Alexander’s Steakhouse in San Francisco, that would appear as a result along with the name of your friend. The same thing could happen for movie results or news articles. Not every search will show social results, and when they do show up, the Facebook module will move up and down the page depending on Bing’s ranking algorithms. In the future, these Facebook likes will appear under related links, and not just within a separate module grouping all “liked” results together. Bing will warn searchers the first few times it starts pulling liked links from their Facebook friends with a pop-up window allowing people to opt-out. You can also disable Bing in your Facebook privacy settings. Along with adding Facebook likes into search results, Bing is also using Facebook data to do better people search. When you start looking for a person, Bing will analyze the people you know and the people they know through Facebook and return those who are most closely linked to you socially. Microsoft’s Yusuf Mehdi says that 4 percent of searches are people search, but results are only satisfying 20 percent of the time. He hopes Facebook can improve on that. Soon, Bing will also looking at social signals on Faceboom to identify experts related to various searches. So when you search for a restuarant, if someone you know has checked in there through Facebook Places or tagged a lot of photos there, or someone you don’t know who has done so publicly, they might show up as an expert.